When I was in my mid-twenties, I received a phone call I never wanted to get. On the line was the doctor who had just performed exploratory surgery on my father. He told me the news was bad and they had discovered colon cancer that had metastasized quite extensively into his liver. I was in shock. Just a couple months prior my dad had been complaining of stomach pain, maybe an ulcer he thought, but certainly no talk of cancer. In that moment, I realized the depth of the foundation my dad provided for me. That foundation had just experienced an earthquake of epic proportions. My heart was breaking, not only because of the cancer, but also because my dad did not know Jesus as Savior. My whole life, since I’d been 8, I had prayed fiercely for my father to become a follower of Jesus. I could not bear the thought of spending eternity separated from this man that I loved with all my heart. 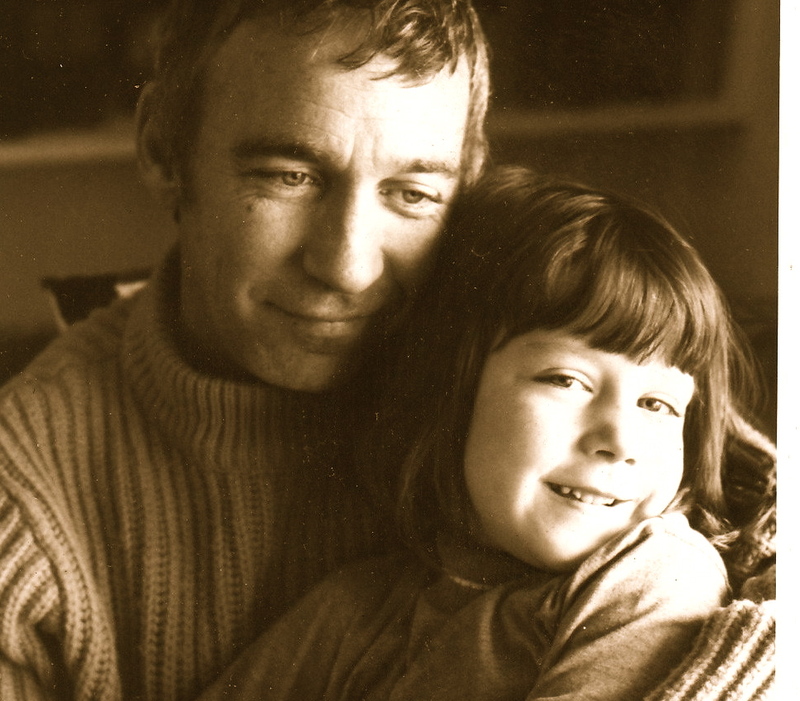 As a definitely daddy’s girl, I wept buckets those first few days. One night as I lay in my bed, tears streaming down my face, I took the Bible that was next to me and opened it to Psalm 23. I just needed that healing Psalm to wash over me and remind me that the Lord was still my shepherd. I read Psalm 23, soaking in every word. I didn’t stop there. I kept reading, through Psalm 24, 25, 26, and into 27. I needed to hear of God’s comfort, to read something to assure my heart that He was at work in the life of my father. As I neared the end of Psalm 27, verses 13 & 14 leapt off the very pages they were printed on and went straight to my soul. It felt like God spoke those verses directly to me. I read it, then re-read it, soaking in every word. I would have despaired, unless…I knew that God had given me those verse to cling to, to hold onto as I walked into the dark days ahead. I quoted those verses, I prayed those words, I rested in its promise to my heart… I would see the goodness of the Lord in the land of the living. I didn’t know what that goodness would be, but I would wait for it and allow my heart to take courage. God gave me those verses so I could stand. Has that ever happened to you? Has there ever been a season, a trial, a disappointment, maybe a heartbreak, that has shaken you to your core? But then you found words from God’s Word that leapt off the pages and wrapped you in the strength you needed to stand? His deep and abiding joy is only possible when we choose to stand in the truth of His Word. What do I believe about my God? Girlfriends, we must choose to STAND in TRUTH. If we are continually distracted by our problems and consumed by our worry, His joy won’t stand a chance. We can say that we want His joy, but if we don’t choose to live in it, it is only a theory. Yesterday we talked about the contrast between the theory of joy versus the reality of joy. If you missed it, here it is. So what are the practical steps we can take to actually do this? 1. Decide to STAND for His joy. This may sound obvious, but take time to tell the Lord you want His joy to fill your life, that you want His joy to be your strength. He delights in hearing your heart…tell Him. 2. Ask Him to show you the areas that stand in opposition to His joy. There are a lot of outside circumstances fighting against joy, but what are your internal responses that choke it out? Are there certain people, places or events that consistently bring out your anger, worry or fear? Is there sin that you continually yield to? Ask the Lord to help you recognize this and let Him speak to your heart about anything that opposes His Truth and His Joy. 3. STAND in the TRUTH of God’s Word. God has given us this amazing gift of His Word. His Word is Life and a light to our path. It brings us comfort, healing, strength and joy. Do you believe that? Then stand in it, stand in the truth of God’s Word. When my father was diagnosed with cancer, God’s Word sustained me. His truth allowed me to walk and stand in His strength and in His joy. The beautiful end to that story is that within a couple months of the diagnosis, my dad did surrender his life to Jesus. And I was the first person he called after it happened. Even as I type those words there is a smile on my face. My father went home to be with the Lord less than a year later. But I will see him again, what a day of rejoicing that will be. Stand in the truth of His Word, and watch how His deep and abiding joy makes its home in your heart. What has God been stirring in your heart in this series on November JOY? How is He revealing His joy in your life? We would love to hear from you. Your comments are an encouragement to others. Take the Joy Challenge and ask others to join you throughout the month of November. By signing-up, you will receive each post automatically. Oh Julie, thank you so much for sharing this touching time in your life. What a miracle! It is through these tough times in our lives that ‘we’ actually grow, it can be an amazing time, if we will only allow Him to lead. His mercies are new every morning!! Amen! Julie, You Rock. So good to see you blogging and It blesses me. Sent this to all the gals in my family. Love you and so proud of you.